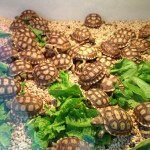 Tortoises (Testudinidae) are a family of land-dwelling reptiles in the order Testudines. 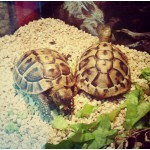 Like turtles, tortoises are shielded from predators by a shell. The top part of the shell is the carapace, the underside is the plastron, and the two are connected by the bridge. The tortoise endoskeleton has the adaptation of having an external shell fused to the ribcage. 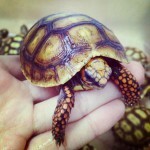 Tortoises can vary in size from a few centimeters to two meters. They are usually diurnal animals with tendencies to be crepuscular depending on the ambient temperatures. They are generally reclusive animals. 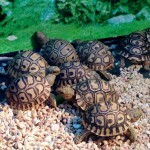 The African spurred tortoise (Geochelone sulcata), also called the sulcata tortoise, is a species of..
Hermann's tortoise (Testudo hermanni) is one of five tortoise species traditionally placed in the ge.. 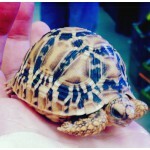 The Indian star tortoise (Geochelone elegans) is a species of tortoise found in dry areas and scrub .. The Leopard tortoise (Stigmochelys pardalis) is a large and attractively marked tortoise found in th..
Red-footed tortoises (Chelonoidis carbonaria) are tortoises from northern South America. They are me..